Soon to be more expensive? The EU-China trade row over cheap Chinese solar panels flooding the European market has been raging on for several weeks now and is threatening to escalate into a full blown trade dispute. On one side, the EU has firmly maintained that it will impose anti-dumping tariffs. On the other, China has postured that any such move will lead to economic retaliation. Meanwhile, somewhere in between, a number of EU member-states (led by Germany) have come out supporting China, fearful the row could hamper national trade-interests with the Asian monolith. Against this increasingly tense background, EU Trade Commissioner Karel De Gucht today presented the Commission’s provisional findings in the anti-dumping case on solar panel imports from China, key points from his press conference below. There will be temporary tariffs imposed, which will play out in two phases: 11.8% from 6 June, and 47.6% from 6 August. De Gucht maintained that this was a “reasonable” decision that had nothing to do with protectionism. 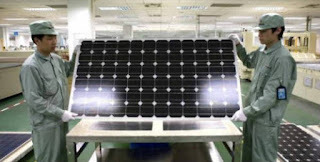 He said that Chinese “overproduction” of solar panels had allowed it to flood the European market with a cut-price product, which, he estimated, should cost 88% more. So in the short term, the Commission sees the tariffs on China, in De Gucht’s words as an “emergency measure to give life-saving oxygen” to a threatened EU solar industry. In the long term, the Commission says it is upholding to the principles of fair trade. Firstly, solar (and renewable energy generally) is subsidised everywhere to some extent. If it didn’t need to be it would be the obvious energy resource for the whole world. This makes it very difficult to judge what the ‘fair’ level of subsidy is or how the market would look without them. In this vein, the whole EU market arose due to significant subsidies and would be unlikely to continue without them in some form (see our previous post for more detail). This makes the claim of protecting jobs and the EU solar industry a bit of a misnomer. Consumers will lose out as prices could well rise from this. At the very least they will be presented with less choice. Many producers and services built around the wider solar industry could struggle as they have become reliant on the cheap Chinese imports. These nuances could show that some competition laws (and not just in the EU) need to be reassessed to account for complex and global markets. The potential for retaliation remains concerning. This could cause harm to the EU’s significant trading relationship with China at a time when Europe can least afford it. As De Gucht himself seemed to note, no decision is made in isolation and the political implications of such a decision should be taken on board. There is also an inherent tension here given that, although the power to judge Competition Policy has be passed onto the EU, Foreign Policy and international relations remain very much in national hands (as they should). Policies which cross this boundary must take account of national preferences in this area. All that said, the Commission has thankfully left itself with an ‘out’ and rowed back significantly on its original hard line position. Using the staggered tariff rate and the two month period for negotiation eases the impact of the decision. Although, relations will likely be tense in the immediate aftermath. The Commission insistence that the ‘onus’ is now on China will probably not go down well. Whether China will play ball and reach an ‘amicable’ agreement as the EU wishes remains to be seen. It will certainly make for an interesting summer of negotiations.